Build, play, and learn all about the wonderful world of LEGO® Disney princess with this Cinderella mini-doll and exclusive carriage model. Discover five exciting adventures starring your favorite LEGO® Disney Princess characters--Cinderella, Ariel, Aurora, Belle, and Mulan. Tips and instructions throughout will inspire your own LEGO Disney Princess builds as you retell their stories. 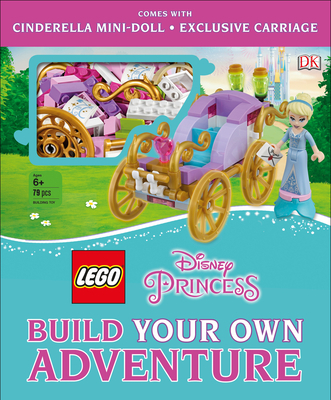 Including a LEGO® Disney Princess minifigure and exclusive model, LEGO® Disney Princess: Build Your Own Adventure combines more than 50 entertaining concepts for building with enthralling story ideas. Build a beautiful carriage for Cinderella using the bricks inside. Then, using your own LEGO bricks, let the magic begin! These concepts will inspire readers of all ages and building abilities, with an appropriate mix of easy, medium, and challenging skill levels.